"The Entry into Jerusalem," Fra Angelico (1387-1455), St Mark, Florence. Larger image. When those Jesus-followers began to untie Sarai, our young donkey, they acted just like they owned her. They didn't ask permission. They didn't look around to see if it was all right. They just began to untie her. I had seen these disciples before. Jesus was a popular prophet in those days, and he often stayed in nearby Bethany, just down the road, with Mary, Martha, and Lazarus. Yes, the Lazarus who had been raised from the dead. That Lazarus. I shouted to my father: "Dad, someone's taking our donkey!" Dad popped out of the house like it was on fire. "Hey, what do you think you're doing?" he yelled. They stopped, startled, but my dad didn't stop until he was three inches from the face of the older disciple. "I asked you a question!" he shouted into the man's face. "We, uh, our Master told us it would be all right," he stammered. "Jesus," said the other. "Jesus said to tell you that he needs it." My Dad suddenly relaxed, stepped back, and put his hand out in welcome. "Jesus." A smile flickered across his face. "Your Teacher is a great man," Dad said after a moment. "I've listened to him for hours. I love what he says about the Kingdom of God being right now." Then Dad began to untie our older donkey. "You'll like this one better," he said. "He's used to people and pretty steady. The other's just a youngster. We haven't broken her yet. She'd be a bit frisky, I'd wager." "Jesus specified the younger, unridden donkey," was the response. "I don't know why." Dad cracked a big smile and said, "Sure, whatever you say." He untied the colt. "You did right by coming here," he continued. "I told Jesus that whatever I own is his if he needs it. It's my pleasure." He handed the reins to the disciple. "We'll return her right after Jesus is finished," the disciple said. "I'll bring her back myself." I couldn't keep quiet. "Dad!" I blurted out. "Dad, could I go along? I'll bring the colt back so it won't be any trouble to Jesus or his disciples." "Oh, you'd just be in their way, Jacob." "He can come along with us," said the disciple. "We'll keep an eye on him. Maybe he can help quiet the colt." "Okay, but you mind, now!" said Dad, and so began an adventure I'll remember for the rest of my life. Jesus was just outside of town, waiting with his disciples and a whole crowd of pilgrims. When the donkey came into sight, a cheer went up. The disciples brought the donkey to the Master. I held the lead rope as Jesus put a small blanket over its back and slid his leg over. As soon as his weight settled on Sarai, she raised her front hooves off the ground and would have bucked Jesus off if he hadn't patted her and said something low and comforting. She settled down immediately and, even in all the shouting and confusion to follow, she carried him with a certain quiet majesty. "What's your name, boy?" Jesus asked me. "Jacob, sir," I answered. "Fine colt," he said. "Tell your father, thank you. He's a fine man, your father." 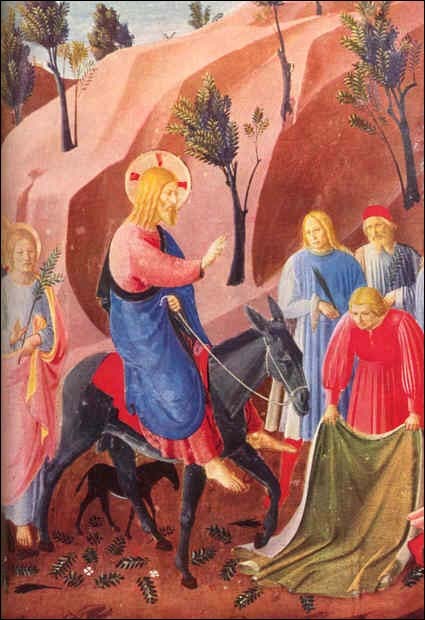 But with Jesus riding the donkey, the crowd was becoming noisier and there was no more time for conversation. We started along the road to Jerusalem, which led right through my town of Bethphage. I was leading Sarai who carried Jesus, followed by hundreds of people. Boy, was I proud! We were used to crowds at Passover. Thousands of these pilgrims would come for the Feast and stay in the towns east of the city or camp along the road. The city itself was literally jammed. "Hosanna! Son of David! Save us." "Hosanna!" went up the shout. Hosanna, which means "save us," was one of the words from a pilgrim chant that was often heard in our streets during the holidays. And so people began to chant the Psalm together. O Lord, grant us success!" "Blessed is he who comes in the name of the Lord. The road climbed a slight rise, and suddenly the city of Jerusalem spread out before us in all its beauty, backlit by the western sun, the gold of the temple glimmering in the distance. All this time I would look back at Jesus when I could. How was he taking this outbreak of applause and adulation? He seemed oblivious to it. "Sad" is the word that comes to mind. He seemed all alone in the center of this jubilant multitude. The singing and the panorama of the city stirred the people more. Some began to pull foliage from palms along the way. They waved the branches and shouted, "Hosanna." Then they laid the palms down on the road so as to create a thatched carpet for the donkey to ride on. Others threw their cloaks on the road for Jesus to ride over. "Hail, to the Son of David!" they shouted. "Hosanna! King from among David's descendants!" "Messiah is coming!" shouted one. The crowd was swelling. Now and again you would hear Lazarus' name shouted out. Just a week before Lazarus had been dead for four whole days, and then Jesus had come and raised him. News of the miracle had crackled like wildfire through our village and Jerusalem and to all the pilgrims as they gathered for the Feast. "He raised Lazarus from the dead!" "Yes, Lazarus!" another would call. "The Kingdom of God is at hand!" The crowds were now overflowing the narrow Jerusalem road and spreading out a few feet on either side of the road, onto the steep slope of the Mount of Olives. When we looked across the Kidron Valley to the Golden Gate on the east side of the temple, crowds were pouring out of it towards us. They were pointing at Jesus and shouting. "Lazarus is alive!" they would say. "Hosanna." They, too, began to rip palm fronds off the trees and sing as they surged to meet our procession. Pharisees were in the multitude, too. They weren't shouting, but mumbling to one another. They considered this display as bordering on blasphemy. Seeing the growing fervor of the crowds, one yelled to Jesus so all could hear, "Teacher, rebuke your disciples." "I tell you," Jesus called back, "if these people were silent, the very stones would cry out." They fumed at his answer. I could hear them shout to one another, "We're getting no where. The whole world has gone after him." But the crowds surged by them, and their catcalls were left far behind. Now, the road turned, and the city walls seemed to rise above us so we had to look up to see their heights. Jesus signaled for to me to wait a moment so I stopped Sarai. The crowd somehow sensed a pause and a hush of awe seemed to come over them. I didn't understand it then. None of us did. But less than forty years later the Romans lay siege to the city, pulled it down, and destroyed it, just as Jesus had foretold. But I was just a boy and it seemed like such a party during that buoyant procession down the hill. What did I know? We met the multitude coming from Jerusalem now and they flowed around us, making the way ahead nearly impassable. I had to push to make any headway, as the path turned upward from the Kidron Brook to the eastern gate of the temple. The road was packed and noisy with shouts of jubilation and cheers. The shouts now echoed against the massive stones of the city walls and across the narrow canyon to the Garden of Gethsemane on the other side. We were at the gate now and Jesus was dismounting. Sarai held still. I looked at Jesus — stared, I guess you might say. Amidst the crowd's fervor he continued to weep. As the crowd now moved with him into the temple, I could see him still. I waved. Among all the waving hands and palm branches he didn't wave back. He just nodded and I could see his lips form the words, "Thank you, Jake." Then he turned and disappeared into the temple. Thank you, Jesus, I thought. Thank you. I held Sarai's rope until the crowds had passed and the road was mostly clear. Then, slowly I led Sarai up the long grade back to Bethphage. I thought of his tears, his tears for me and mine, for my family and my people. And as I walked I chanted, step after step, as I trudged up the hill. It began as a chant anyway and ended as a kind of prayer. Save us from our sins! This short story is fictional, but based on the accounts of the triumphal entry in each of the four gospels: Matthew 21:1-9; Mark 11:1-10; Luke 19:29-38; and John 12:12-15.